Bodacious Biscuit Love: Is Your Pup's Thanksgiving Plate O' Food Safe? Is Your Pup's Thanksgiving Plate O' Food Safe? Can you believe that Thanksgiving is only 2 1/2 weeks away? A day to give thanks, gather with friends and family and enjoy turkey, all the fixings, endless amounts of pie and maybe...an adult beverage or two. Food! Food! Food! And...the LOOK! If you're a parent to fur kids, you know that look all too well. 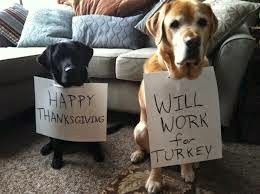 Our fur-kids are family and we want to include them in Thanksgiving festivities by making them a plate filled with turkey, gravy, mashed potatoes and whatever else the "hoomans" are feasting on. Nothing brings on more "ooohs" and "aahhhhs" than watching our bundle of furry love scoff down a plate of Thanksgiving food with gusto. I'll be the first to admit, I've done this in the past too. However, that came to a screeching halt some years ago when a small plate of Thanksgiving fare caused my pup some tummy distress and two days of diarrhea. That didn't stop me from making a Thanksgiving plate for the fur-kids in the years to follow. However, what went on the plate was much different than what the "hoomans" were eating. Instead of dark meat (which is laden with fat), I used white meat. No gravy. I put some boiled potatoes and sweet potatoes aside before converting them to mashed potatoes and sweet potato casserole. And the bread was torn up into pieces without butter. I left out the stuffing. Problem solved. My pups were happy with their feast and I had a peace of mind that their tummies wouldn't suffer. I know a few "hoomans" who swear their pups can eat anything. That may be the case. However, like with our fur-kids, sweet Sophie and lil' Coco bug, we have to be extremely careful about what they eat. In addition, it's very important to keep in mind that hidden ingredients can be harmful to our babies...some even fatal. Take stuffing for example. It seems harmless as the main ingredient is bread. However, if onions or raisins is one of the ingredients in the stuffing, it can cause serious problems if ingested. It's important that we keep our fur-kids safe over the holidays. That includes letting your guests know what is safe and what isn't. A plate of safe holiday fare is useless if your Aunt Gertie is feeding Fido stuffing and turkey dipped in onion gravy under the table. It's up to you, as a fur-parent, to put your foot down.